Not unless it's a boulder. I've complained in the past that Scooter spends too much time roaming around the airwaves, looking for new ideas to borrow and implement in their own songs, instead of sitting around in their studio and coming up with their own song concepts. Many Scooter fans (and non-Scooter fans alike) have become annoyed by this now common Scooter practice. And this single is no exception -- they have taken their main chorus from a 1979 song, "Whatever You Want", by the supposedly legendary British rock group Status Quo, vocals included -- and turned it into a jumpstyle production. 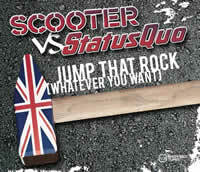 However, there is one difference between other singles and this one: the source band, Status Quo, has not only agreed to have their name put in part of the artist name (as Scooter vs. Status Quo), but they must have liked the song enough to even agree to appear in the music video to sing their parts! There's something strange going on here, but it legitimizes Scooter's sampling...this time. Indeed, the chorus from "Whatever You Want" appears multiple times throughout the Radio Edit and Extended Version. However, instead of just planting the original vocals over some typical jumpstyle synths, they have also opted to include the electric guitar riffs from the original as well, shuffling the jumpstyle elements to the distant background. They're there, but you may not notice. Between bouts of rocking out, frontman H.P. Baxxter is right there in your face to give some MC shouts over the same bassline they've been using for pretty much all of their popular jumpstyle releases. Thankfully, H.P. is fairly coherent this time, not resorting to absolutely absurd brain spouting as he is often known to do; his lyrics are more sensible and generalized than usual, probably so Status Quo won't get pissed off. That's a good idea. Surprisingly, the rock and jumpstyle elements actually combine well together; if you were to play this one at a party, both the electronic nuts and the rock jocks should be able to enjoy it. Plus it can get some ladies bumpin' and grindin', and isn't that what music was invented for? "The Telecaster" Club Mix is a different affair altogether. It starts off with a much more tech trance-driven vibe, eventually making its way to the main event with chimes and other classic synths. In the middle of the song, the guitar part of "Whatever You Want" is prominent, but nowhere can you find the raving lunacies of H.P. Baxxter or even the vocals of Status Quo. After a rather lengthy guitar break, we are treated to the same melody but only with major stadium-echoed jumpstyle...not once, but twice (after a bit of a pause)! The song gets faster at the end, arriving to an epic but brief conclusion without any outro of sorts. This is very much like the song "Jump That Rock" that Scooter played on its "Jumping All Over The World" tour in early 2008, and the one that's featured on the UK version of the album "Jumping All Over The World". And to conclude the single, we have, as usual, a B-side: the aptly titled tune, The Hi Hat Song. Lately, their B-sides have not had the best reputation for being consistently good. This one may polarize opinions further, as over half of it is pretty much just hi-hats and beats with a few sound effects thrown in for good measure. It isn't until about two-thirds of the way through the track that the actual melody comes in. It's not particularly catchy but it is strongly trance-related (and repetitive after a while), so kudos to Scooter for trying to sidestep their jumpstyle mood these days, if only temporarily. But overall, there could have been more work done on this one... like cutting the build-up part by about half at the very least. I guess you could say it's experimental, which I wouldn't declare as unwelcome by any means. And if that isn't exciting enough, you can also watch the video or the "Making Of..." feature on the enhanced CD. The video features both Scooter AND Status Quo, plus pole-dancing women, the jump troupe "Scooter Jumpers" hopping around on the ceiling, and a giant British hammer. Could you really want anything else? It's actually a darker video than usual, but it's a welcome change from a bunch of blokes performing jumpstyle dancing over and over again. That gets old fast. Scooter's previous four singles were all jumpstyle related, and I guess this marks the fifth one, but it's clear that Scooter are not happy sitting on the laurels of their previous success. Yes, they had three Top 10 singles in Germany from their most recent album, and that particular album also hit #1 in the United Kingdom, which was pretty much damn near unexpected. But keeping on going with the same ol' song and dance (or song and JUMP) is the equivalent of stagnation. That's why "Jump That Rock (Whatever You Want)", mixing some of their jumpstyle influences with classic rock, is a solid move for the Hamburg trio. It may be not be completely the work of Scooter (thanks to Status Quo, of course), but it may be the most rockin' (not jumpin') release they've had in years.